President Donald Trump and first lady Melania Trump greet French President Emmanuel Macron and his wife Brigitte Macron at the White House, Monday, April 23, 2018, in Washington. 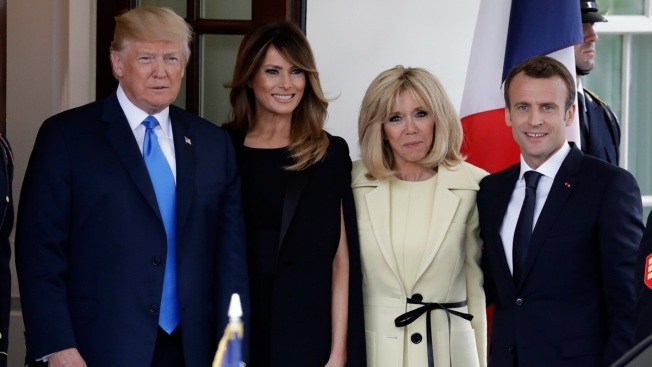 Tending to bonding before business, President Donald Trump and France's Emmanuel Macron opened the French president's visit Monday with an anything-but-ordinary double date with their wives at George Washington's house. The presidents and their spouses hopped on a helicopter bound for Mount Vernon, Washington's historic riverside home, for a private dinner one night before the leaders sit down for talks on a weighty agenda including security, trade and the Iran nuclear deal. Macron's pomp-filled three-day state visit to Washington underscores the importance that both sides attach to the relationship: Macron, who calls Trump often, has emerged as something of a "Trump whisperer" at a time when the American president's relationships with other European leaders are more strained. Trump, who attaches great importance to the optics of pageantry and ceremony, chose to honor Macron with the first state visit of his administration as he woos the French president. "This is a great honor and I think a very important state visit given the moment of our current environment," Macron said after his plane landed at a U.S. military base near Washington. 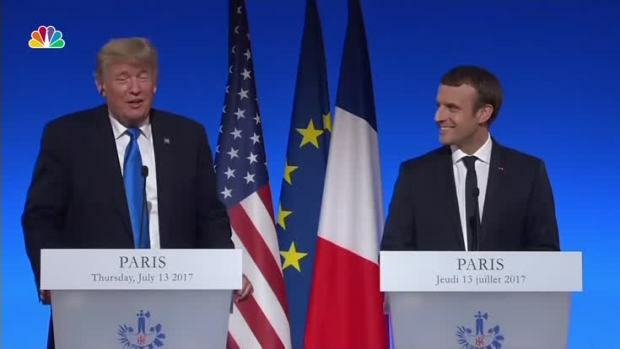 President Donald Trump adopted a complimentary tone during a joint U.S.-France press conference with French President Emmanuel Macron, calling him a great leader and praising Paris despite the latter's documented social media rebuttals towards the Trump Administration and their policies. For all their camaraderie, Macron and Trump disagree on some fundamental issues, including the multinational nuclear deal, which is aimed at restricting Iran's development of nuclear weapons. 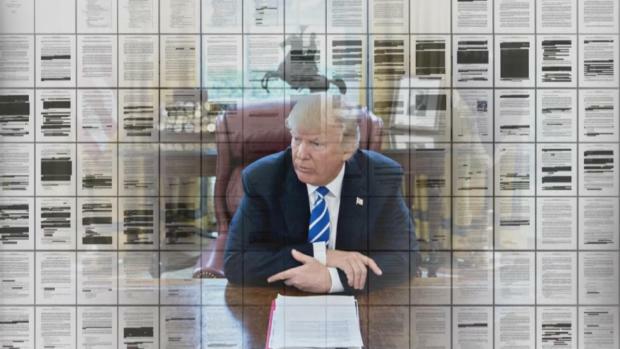 Trump, skeptical of the pact's effectiveness, has been eager to pull out as a May 12 deadline nears. Macron says he is not satisfied with the situation in Iran and thinks the agreement is imperfect, but he has argued for the U.S. sticking with the deal on the grounds that there is not yet a "Plan B." "During the state visit, we will have the opportunity to discuss a lot of bilateral issues and to discuss about our security, about trade and a lot of multilateral issues very important for our countries and beyond our two countries," Macron added upon his arrival Monday afternoon. The Trumps and Macrons helped plant a tree on the White House grounds together before boarding Trump's Marine One helicopter for a scenic tour of monuments built in the capital city designed by French-born Pierre L'Enfant as they flew south to Mount Vernon, the first U.S. president's home along the Potomac River. After Trump's helicopter landed at Mount Vernon, the two presidents, each holding his wife's hand, walked a short distance and posed for pictures before they boarded golf carts that ferried them to the front door of Washington's plantation house. The couples were led on a brief outdoor tour before they entered the pale yellow building for dinner of Dover sole, pasta stuffed with lemon ricotta, and chocolate souffle and cherry vanilla ice cream. Trump declared the dinner "really fantastic" before returning to the White House. He ended his first year in office without receiving a foreign leader on a state visit, the first president in nearly 100 years to fail to do so. He was Macron's guest last July at the annual Bastille Day military parade in the center of Paris. Macron and his wife also took Trump and America's first lady on a tour of Napoleon's tomb and whisked them up in the Eiffel Tower for dinner overlooking the City of Light. Macron will be welcomed back to the White House on Tuesday with a traditional arrival ceremony featuring nearly 500 members of the U.S. military and a booming 21-gun salute. The state visit also offers Macron his first Oval Office sit-down with Trump and a joint White House news conference. There's also a State Department lunch hosted by Vice President Mike Pence. The French president's White House day will be capped Tuesday night with a state dinner, the highest social tribute a president bestows on an ally and partner. State dinner tickets are highly sought after by Washington's political and business elite. A few of those expected to attend: Christine Lagarde, head of the International Monetary Fund and a former top French government official; House Speaker Paul Ryan, R-Wis.; Treasury Secretary Steven Mnuchin and his wife, Louise Linton; Defense Secretary Jim Mattis, Sen. Bill Cassidy, R-La., and Mike Pompeo, Trump's choice to be the next secretary of state.